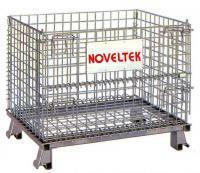 Warehouse cage L1200 × W1000 × H900 mm Load: 1500 KG A-7(KG A-7) - Noveltek Industrial Manufacturing Inc. Warehouse cage, also known as：butterfly cage, storage cage, metal working material box. Understanding stackable 4-storey; trucking, stackable two-storey do not use can be folded a few months Diego high piled up less space. Use of space for warehouse management, goods separate classification of a small amount of storage, easy to inventory, to avoid turning the warehouse trouble. ◆ Can be used in stores to display merchandise. ◆ Can adopt multi-layer high amount of heap to use, resulting in the effect of three-dimensional storage. ◆ In line with all kinds of transport equipment (forklifts, hydraulic pallet truck), reduce losses and labor costs. ◆ When not in use, the accumulation of folding managing collections, can be folded when not in use to pile up, only 20% of its original volume.